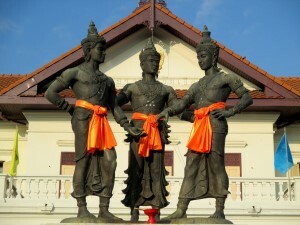 On this page you will find all the information you need on how to get to and from Chiang Mai International Airport by Tuk Tuk, Taxi and the Red Cars or Songthaews. To and from the downtown area of the city (known as the "Old City") it takes just 10 minutes to get to the airport which is located about 3 - 4 km south-west of the city moat. 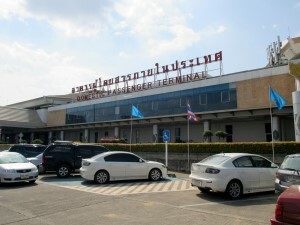 CNX Airport is now one of the busiest airports in Thailand and is served by many airlines (full list at the bottom of this page). 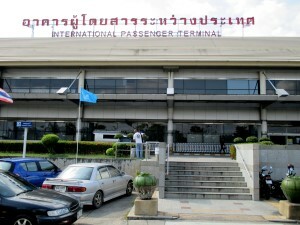 It is a single building which is divided into two parts: The Domestic Terminal and the International Terminal. From April 2015 there is a new "Airport Shuttle Bus" service in operation taking passengers from the airport to the major hotels in the city for just 40 Baht, on two separate routes. 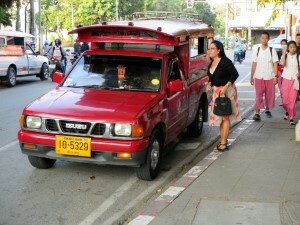 Songthaews (which are called Red Cars in Chiang Mai) are passenger vehicles used as shared taxis. There are a lot of them roaming the streets of the Northern Thai capital. They follow a 20 THB fare system for any destination in the Old City (within the moat), but for longer distances such as to the airport you will have to negotiate with the driver. From downtown to the airport 30 – 40 THB per person is a fair price. You almost don’t find any motorbike taxi in Chiang Mai, but you do find the usual Tuk-Tuk. 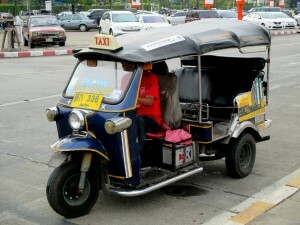 If you are not new to Thailand, you already know that to get a fair Tuk-Tuk price can be a very difficult task. 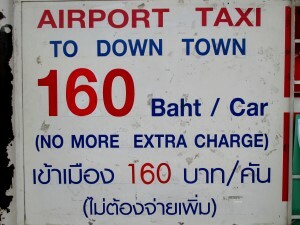 From downtown to the airport expect to pay around 60 - 80 THB. 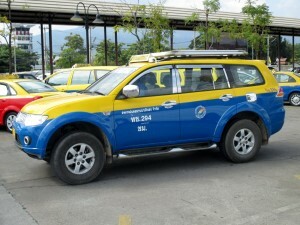 Contrary to Bangkok there are very few taxis in Chiang Mai, however, if you stay in a tourist area it should not be a problem to find one. Anyhow, you can always ask your hotel to arrange one for you or to give you the contact numbers for taxi companies in Chiang Mai. From the city centre to the airport you should expect to pay a flat rate in between 100 - 150 THB during daytime and around 200 THB at nighttime. 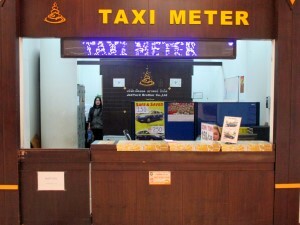 It can be quite difficult (or even impossible) to convince a taxi driver to go by the meter, but if you manage to do that here is what you need to know: Taxi meter starting price is 50 THB up to the first 2 kilometres, then it costs 10 THB per kilometre. 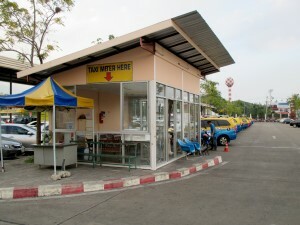 On the parking lot outside the Domestic Passenger Terminal Gate #1, you will find the metered taxi area. 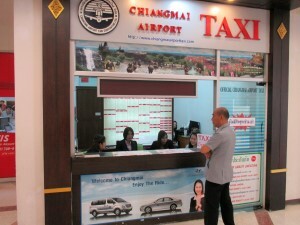 Inside the 2 Terminals you will find some taxi counters from where you can arrange a metered taxi or a flat rate taxi. 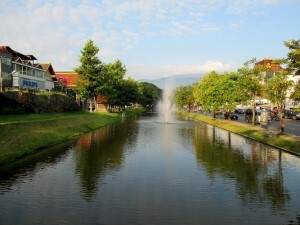 Find the best places to stay in Chiang Mai. 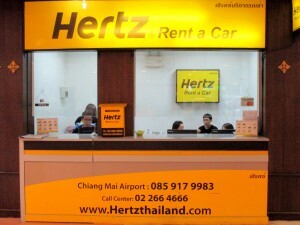 If you want more freedom while staying in Chiang Mai, why not rent a car! 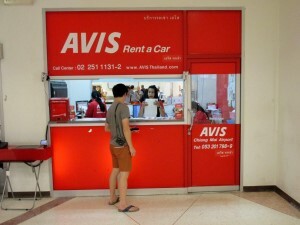 You will find the usual international companies such as Avis or Hertz as well as local companies such as Thai Rent a Car. Prices (at least with Thai companies) are much cheaper than in Europe or in North America. The cost of renting a car per day ranges from 1000 to 1700 THB for a small sized car and from to 2000 to 3200 THB for a bigger vehicle. 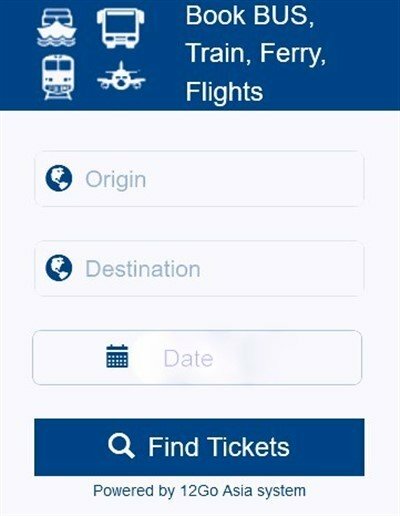 If you are coming from CNX Airport and want to go to the city, you will find that all the three companies already mentioned above are found at the airport. 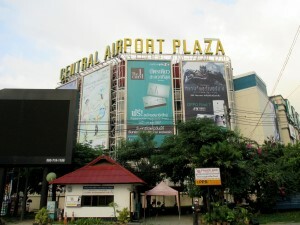 About 500 metres east of the airport along Mahidol Road is one of the biggest city shopping centres: Central Airport Plaza. If you arrive too early to catch your flight, you could kill time shopping or eating at the many food outlets here.